At this point, election night TV sets have grown so ludicrously overloaded with high-definition bells and whistles that the only truly shocking development would be a somebody reading returns off a piece of paper at a plain desk in front of a bare white wall. Tonight is no different. The AP reports that, “NBC is dressing up New York’s Rockefeller Plaza, with the front of its headquarters lighting up in red and blue to mark the electoral progress of Hillary Clinton and Donald Trump and a map of the United States superimposed on the famed skating rink,” while their description of CNN’s plans includes the phrase “John King is back in front of CNN’s Magic Wall of data.” Yes, it’s shaping up to be another bewildering, eye-strain-inducing night in America. But of course, what passes one year for sleek and cutting-edge will soon enough look comically dated. Let’s kick it off with a couple of outtakes from this supercut of election night moments through the years collected from CBS, specifically. You can hardly see, it’s so low-def, but you can tell they’ve set up shop in what appears to be a disused soundstage from Lost in Space. Maybe it looks to you jaded children of the 1990s that Walter Cronkite is reading off an old-fashioned “this is what’s for lunch” board but I’ll have you know those numbers move without sending a lower-level employee over to handle them manually. Things had practically warped into the future for the 1972 election over at NBC. The effect? Somewhat like the inside of a Soviet power plant. In the early decades of network TV news, election coverage was the main source of bragging rights for CBS and NBC (ABC’s news division was an also-ran until the 1980s). They invested heavily in sleek sets that resembled the decks of aircraft carriers. Mammoth computers offering predictions before the polls closed received camera time to give the proceedings an air of futuristic wizardry. Vast sums of money were poured into polling and research as the pressure to call winners first was fierce. Albeit, one where you could watch a young Barbara Walters in an incredibly alarming red room. But it was a straightforward stylistic innovation that, perhaps more than anything else, launched the arms race that created the dizzying visual bonanza you’ll see on your TV tonight. That would be putting the state-by-state results on a giant map, flipping each one Democrat or Republican. Enter the red state/blue state era, which began with the 1976 NBC News broadcast. NBC’s technicians and stagehands built a map with states made out of translucent white plastic. Lights with colored gels illuminated a state in either red or blue based on the results. The color schemes were based on the American flag and the rosettes worn by the members of British Parliament — Labour Party red for the Democrats and blue for the Republicans in honor of the Conservative Tories. The 14-foot-high and 24-foot-long map took up much of the back wall of Studio 8H, which recently had become the home of “Saturday Night Live.” The sketch show, only in its second season at the time, was exiled to NBC’s studio located in the less-than-glamorous Brooklyn neighborhood of Midwood for three weeks to make room for the preparations involved in the network’s “Decision 76” coverage. “It’s enormous and it’s gorgeous,” anchor David Brinkley told his audience. (Can’t begin an election night without bragging about your latest toy.) “It was groundbreaking in that it was constantly on the screen,” said Manning’s son Douglas. From there on out, it was a question of piling on additional details, like a pair of German princes feuding via increasingly rococo palace refurbishments. 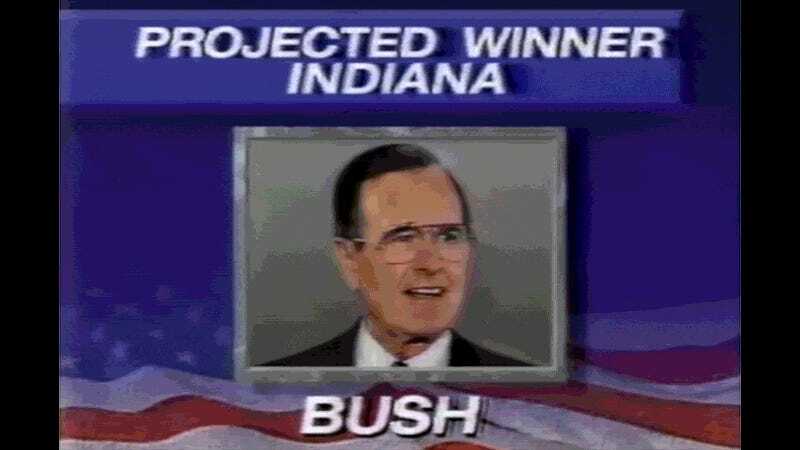 By 1980, NBC’s “election center” looked like the movie War Games. Also, graphics had reached such a wonderfully advanced state that you could flip the year’s logo around while it zoomed at the viewer! By 1988 computers were so powerful that they could reveal electoral counts like turning over a tarot card. Thanks in no small part to Peter Jennings’ choice of suit jacket, the 1992 ABC election set looked like a Bond villain’s lair. Nowadays there’s so many layers of information on every frame it’s like trying to watch a damn Star Wars prequel. Is George Lucas directing? Is that why everything’s such so headache-inducingly dense with numbers and facts and figures and graphics and crawls? But as television news gears up for 2016’s big finale, an intense public distrust in the media is threatening the networks’ traditional role as election night scorekeeper. There is a divided electorate, big segments of which are poised to question the veracity of Tuesday’s results. Donald J. Trump has refused to say if he will concede in the event of a projected defeat. And new digital competitors plan to break the usual election-night rules and issue real-time predictions long before polls close. The era of Tim Russert’s famed whiteboard — when network anchors could serve as the ultimate authority on election results — has faded. And scrutiny on big media organizations on Tuesday, when 70 million people might tune in, is likely to be harsher than ever. But what if it’s a really good hologram this time?